This is a very impressive debut genre novel that I didn’t expect to enjoy quite so much. 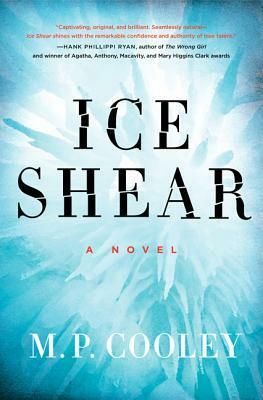 My initial expectations were somewhat low because so many of the elements of “Ice Shear” I would describe with the word ‘average’. The plot is suitably complex. The writing is straight-forward, though very descriptive, with realistically rendered dialogue. The protagonist seems like a regular woman. The pace is constant and the small town setting is well-rendered. Together this makes an enjoyable police procedural read, a novel that is really good, but where nothing really screams out as being exceptionally unique, innovative, controversial, or profoundly insightful. So what sets it apart from any other mystery novel out there is it is so ‘average’? Why in my heart do I feel like this is a really successful novel that was well-worth reading? I think the answer to those questions lie in just how effectively Cooley manages to take the ordinary and produce a tight, well-crafted mystery out of it where everything does feel satisfying without becoming dull and mundane. Most impressive to me is Cooley’s protagonist June, a former FBI-agent returned to her hometown to serve on the police force. June is deceptively simple, one of the most realistically rendered female characters I’ve come across. Here strengths and weakness are given subtly, and her personality is one of straight-forward perseverance, simply being a good investigator and human being. Relatable and likable, she is flawed and challenged, but she overcomes and the reader enjoys the experience of seeing how she does so. Cooley also manages to put in just the right amount of ‘outside’ information and personal conflict outside of the main crime plot thread. You learn a bit about June’s past and her family and professional relationships, but readers aren’t pulled too far down any side-tracks that don’t have bearings on the novel itself. This leaves Cooley room to further develop the character in future novels, hopefully just as effectively.